Based on here, I believe that the enzymes in milk can break down gluten and prevent the bread dough from rising. 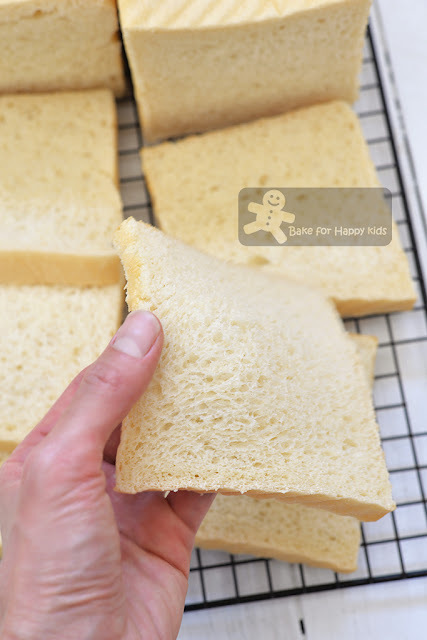 Hence, some bread recipes that I really like at here, here, here, here, here and here use either scalded milk or milk powder with water so that the enzymes are deactivated, resulting the breads to rise higher and fluffier. Having said that, I also like some bread recipes at here, here, here, here and here that use fresh pasteurized milk (not UHT). Why? Looking at these recipes very closely, I have noticed that there are additional thickening / leavening agents added in these milky breads. And it is true that these thickening ingredients such as condensed milk, eggs, corn syrup and honey will help the dough to rise better even in the presence of the fresh milk enzymes. Yet, there are two ALL-FRESH-MILK bread recipes that I have came across at here and here that are very interesting! 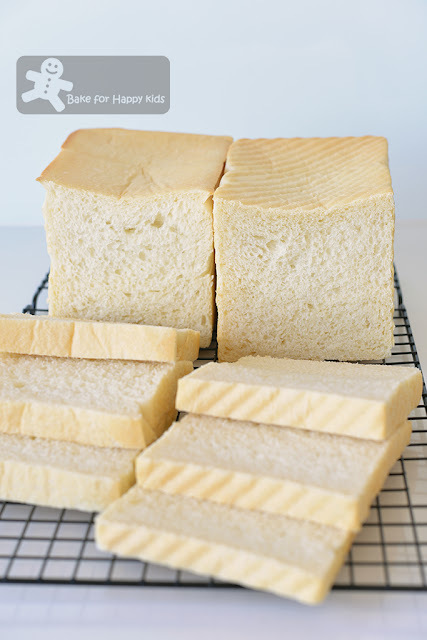 Without the addition of extra thickening / leavening agents, these less-risen fresh-milk breads are surprisingly moister with denser milky crumbs but the recipes will have to be scaled up slightly in order the breads to rise enough to form tall perfect square loaves. Still not good enough? 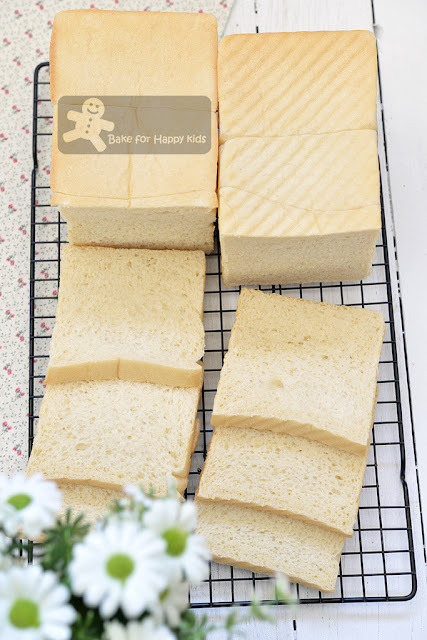 Then, the curious health-conscious me wonder if I can bake these maximal milky breads at here with less salt and less sugar. To do that, I have to enhance the taste of the breads by baking them with all-butter and of course, not too much butter! And these are my newly formulated perfect square Japanese Milk Shokupan 食パン with significantly less salt and sugar... Wow! They are so moist and snowy milky white! Made with milk, less salt, less sugar and LOVE! To me, these breads are awesome!!! Made with the maximal amount of milk, I can promise you that these breads are very milky and moist but please be aware that they can taste more to plain due to their low salt and sugar content. Yes!!! The health conscious me have reduced the added salt from 12g to 4g and sugar from 40g to 30g and improved the taste by replacing 25g vegetable oil with 30g butter. Guess what? I have no regret at all for doing that. LOL! Yay! Here are my two perfect Shokupan! Wow! The lightly crusty breads are so soft and moist! It doesn't taste sweet and salty but it tastes very milky, moist and soft!!! You know... I have been a very hardworking mum slash blogger! LOL!!! 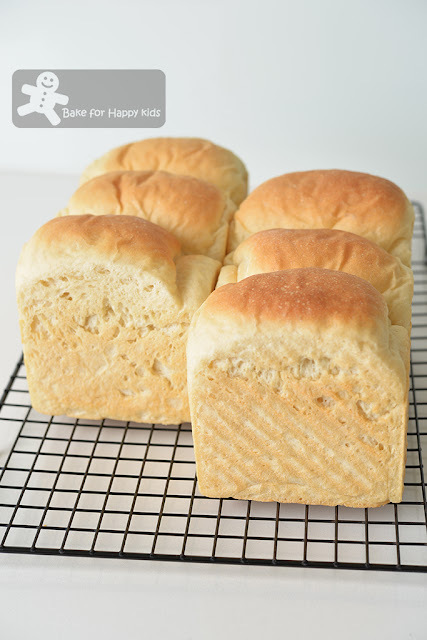 Besides baking these breads with milk and butter, I have also tried using soy milk and vegetable oil to bake the same recipe but it didn't work very well. 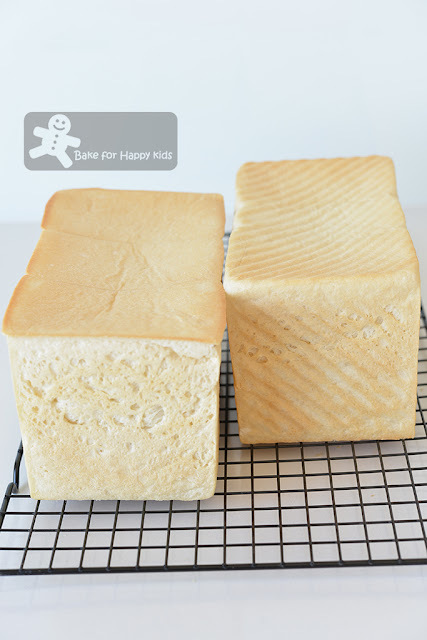 These vegan soy milk breads turned out to be denser and less moister than the regular-milk breads. So please do not substitute the fresh pasteurized milk in this recipe with other types of milk!!! These soy milk breads won't rise tall enough to form a perfect square. And they are denser and less moister than the regular-milk breads. So please do not substitute the fresh pasteurized milk in this recipe with other types of milk!!! Now, here's a video showing how I baked these very moist soft milky snowy white Japanese Shokupan 食パン. Here's the recipe that is modified from here. WARNING: This bread dough is fully loaded with milk and can be sticky and difficult to handle! Please use a breadmaker or an electric mixer with hook attachment for kneading and do not knead the dough by hand. You can use half of the recipe to make one loaf of bread. *The milk in this recipe doesn't require scalding but need to be lukewarm for efficient proving. If breadmaker is not available, kneading by electric mixer with a dough hook is possible. Using an electric mixer with low mixing speed, mix all ingredients except butter to form a dough first. Then, add butter. Keep kneading with the next higher mixing speed for 25-30 mins or until the dough is smooth and elastic. This dough will be very elastic and should be ready if it passes the window panel stretch. Transfer dough into a large bowl and cover it with a cling wrap. Allow the dough to rise in a warm and humid place for about 1 hr or until doubled in size. Please note that the smooth dough can look a little spongy after proving. Grease loaf pans and their lids with oil or cooking oil spray. To shape, divide dough into two and further divide each half into 3 portions (about 215g each) and shape all into smooth balls. Allow them to rest at room temperature for about 10 mins. Place three of the shaped dough with their seams side down into the each prepared pan. Press the top of the dough lightly to form an even surface. Allow the loaves to prove for another 1 hr or until the dough is going to reach the maximum height of the loaf pans. Cover loaf pans with their lids. Preheat oven at 180°C. Bake at 180°C for 25 mins or until thoroughly baked. When the bread is removed from the oven, remove the lids and unmould the bread immediately. Transfer bread on a wire rack to cool it completely. To store, wrap tightly in plastic wrap and keep at room temperature for 2 days or freeze in serving portions for 2-3 months. And I strongly recommend freezing because it will preserve the moist and soft texture of these breads a lot better. Thank you for sharing, I will put it in my Wish list, will make it after I try the Brioche.